GroupDocs Newsletter February 2019 edition brings you latest news and updates related to all recent API releases plus much more. 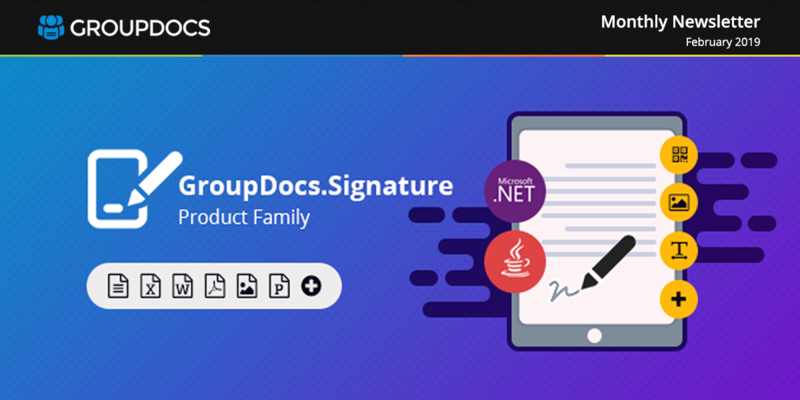 In the spot light is GroupDocs.Signature Product Family, which is an extensive collection of .NET and Java document e-signing APIs, allowing programmers to digitally sign their multi-format documents by adding various types of e-signatures including text, image, barcode, QR code and metadata signatures. In other product news, GroupDocs.Search APIs for .NET and Java platforms now support blended characters and wildcard character search functionality to further enhance your indexing apps. While e-signing Image files within your .NET apps, you can add or search metadata with the help of GroupDocs.Signature for .NET API. There are a few notable code examples also highlighted in this newsletter; you can render filtered messages from Microsoft Outlook data files OST & PST on .NET platform. Seamlessly convert your Java based IGS, PLT and CGM file formats, or, programmatically change page orientation (portrait, landscape) of your documents within any type of Java apps.